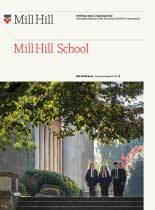 There are many opportunities to participate in out of school activities at Mill Hill and we hope that every single pupil will find at least one area of interest to stimulate and enthuse them. A unique feature of Mill Hill is its innovative Lower Sixth Partnership trips: every summer, Lower Sixth Form pupils have the opportunity to work for between two and three weeks in a variety of educational projects with partners in Zambia, India and Nicaragua. Those that take part in one of these trips often talk about them being a life-changing experience. For those with an adventurous streak, the Combined Cadet Force provides an opportunity to discover the secret of teamwork and to develop the skill of leadership. Here pupils can learn a variety of skills including sailing and flying. Members of the CCF attend regular camps at venues across the UK. Additional ‘adventure activity’ weekends at Brenscombe Outdoor centre are also on offer to pupils in the Remove (Y10) year. A French Exchange with our partner school in Rouen has been running for almost fifty years and additional languages trips run to Barcelona and/or Granada (Spanish) and Leipzig (German). The English and Theatre Studies departments are of course ideally placed to take advantage of London, one of the world’s great theatre centres, and there are a number of evening trips that take place every single term. And recent Music tours have seen our musicians and singers perform in venues as diverse as York Minster and Disneyworld Paris. Sports men and women at Mill Hill also have the opportunity to display and develop their skills in countries across the world. For example, 2012 saw a Girls’ Hockey trip to Spain and a Boys’ Rugby tour of Argentina and Chile. 2014 will see an Under 15 Cricket tour to Sri Lanka and a Girls’ Netball trip to Malta. And every Saturday sees a wide range of fixtures involving pupils travelling all around the South of England.